Happy New Year! I hope you and your loved ones enjoyed a wonderful holiday season. We certainly did, but now it’s back to reality. That means school is back on and new after school activities are beginning. For me, since I manage most of the day-to-day activities at home, I need some time before adjust back to our schedule. 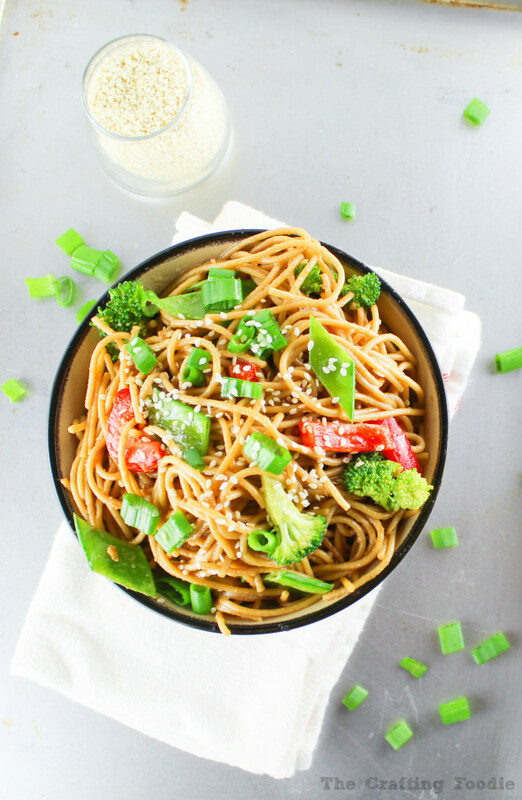 As a result, that puts me in a time crunch for dinner, so this quick and easy peanut butter noodle dish is the perfect weekday dinner. The most difficult part of these peanut butter noodles is cutting the vegetables. You can choose any assortment you’d like. Red bell peppers, snow peas, carrots, broccoli, and a bit of green onion are a favorite combo at our dinner table. Once you chop your vegetables, all you have to do is dump all the dressing ingredients into a large bowl, boil the noodles, and mix everything together. If I have time, I add tofu to the noodles, and actually my girls love the tofu. I make it crunchy by pressing all the water out of an extra firm block of tofu (I place a clean kitchen towel in a pie plate, then put the tofu on top of the towel. Next I place a heavy saucepan on top of the tofu. To add additional weight to the pan, I place a 28-ounce can of tomatoes inside the sauce pan. After placing the contraption in the refrigerator, by morning tons of water is pressed out of the tofu.) Before pan frying the tofu, I chop into small pieces, dredge it in corn starch and fry it. It makes for the crunchiest tofu ever. I promise! 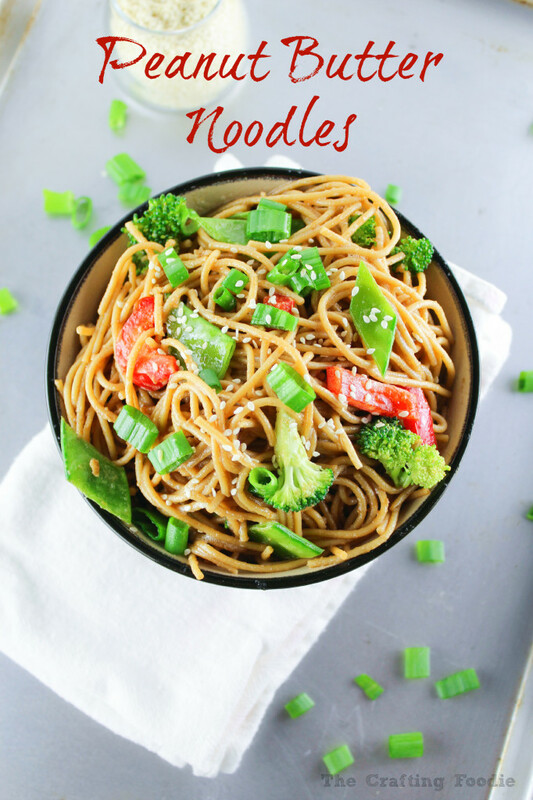 I’m sure you’ve seen tons of recipes for peanut noodles, but this recipe is so darn delicious and easy. All of the dressing ingredients are probably something you already have in your pantry. Just throw in any vegetables you have in the fridge, boil some pasta, and toss it in a flavorful dressing. This is a favorite quick and easy dinner in our home, and I think it will be in yours too! 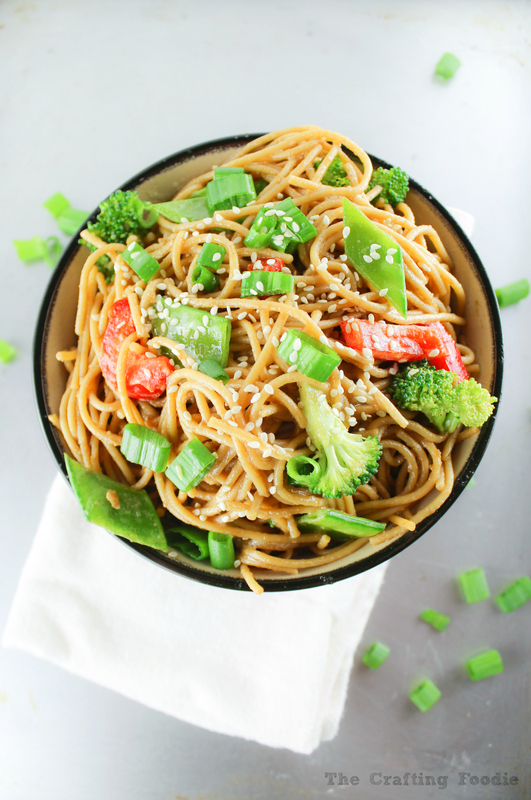 For a healthy, flavorful, quick meal, these peanut butter noodles are perfect. Raw vegetables and pasta are tossed in a creamy, tangy dressing. If you are adding tofu to your noodles, follow the instruction in the post to drain the tofu. Once the tofu is drained, dice it. Toss about ½ a cup of corn starch into a large zip-top bag. Add the tofu cubes to the bag, and shake until the cubes are coated in corn starch. Using a strainer, shake off the extra corn starch. In a skillet with a shallow amount of vegetable oil, fry the tofu until it's crisp. Drain the tofu on a plate lined with paper towels. The tofu will be very hot. Set it aside to cool while preparing the rest of the noodle dish. Set a large pot of salted water to boil. Follow the directions on the pasta package to prepare the pasta. While the pasta boils, make the dressing. Place the first five ingredients in a large bowl, Then add the peanut butter, and whisk until combined. Then add the garlic and ginger. Mix until combined. Once the pasta is cooked. Drain it. Then toss the warm pasta in the peanut butter sauce. Add the broccoli to the warm pasta so it cooks a bit. Then add the rest of the vegetables and the tofu. In a dry pan add the sesame seeds and brown just slightly. Add as a garnish to the noodles. This recipe is adapted from Ina Garten’s Crunchy Noodle Salad. This sounds fantastic! I love all the crunchy, vibrant veggies you have in there, and the crispy tofu sounds incredible! Thanks so much Allie! The tofu is so good. It gets super crunchy! Definitely try the tofu! It gets so crunchy on the outside and it’s warm and fluffy on the inside. My kids LOVE it. They even eat tofu alone (no sauce or anything) when I prepare it like that! This looks heavenly. I love Asian dishes and incorporating more veggies into any dish is an extra bonus! Thanks so much Kristen! It’s so easy, and the kids love it. It makes dinner time a breeze! These sound delicious and I’m sure my menagerie would be head over heals for them! Menagerie – I love it. I need to start referring to my kids that way 🙂 I have yet to meet a child who doesn’t like this dish. Looks like an amazing recipe! We love Asian food here, so I will definitely add this to the list of new things to try! Thanks so much Cindy! It’s such a simple recipe, but it tastes to good! I hope you love it as much as we do! Thanks so much Cathy! It’s a simply but delicious. And thanks for stopping by The Crafting Foodie! Thanks Kristen! I agree – peanut butter for all! this looks amazing! I pinned this to attempt later! Thanks, Lauren! I promise that it’s super easy and really delicious. These look so good! I love Thai inspired noodle dishes! Yum. Thanks for linking up to The Creative Collection Link Party. I wonder how this dish would be without the peanut butter? I know that’s the point of the dish, but we have peanut allergies over here 🙁 I want to incorporate more tofu in our family’s diet because my kids are not big fans of meat. This looks like a very yummy dish though! I’ve made with with sun butter (the spread made with ground sunflower seeds), and it was delicious. It gives you the same creamy texture without the nut allergies! A friend of mine actually just make this using sun butter, and her family loved it. This crunchy tofu is such a great way to add tofu to just about anything. We use it in stir fries and fried rice all the time. I hope you give it a try! Thanks so much for stopping by! 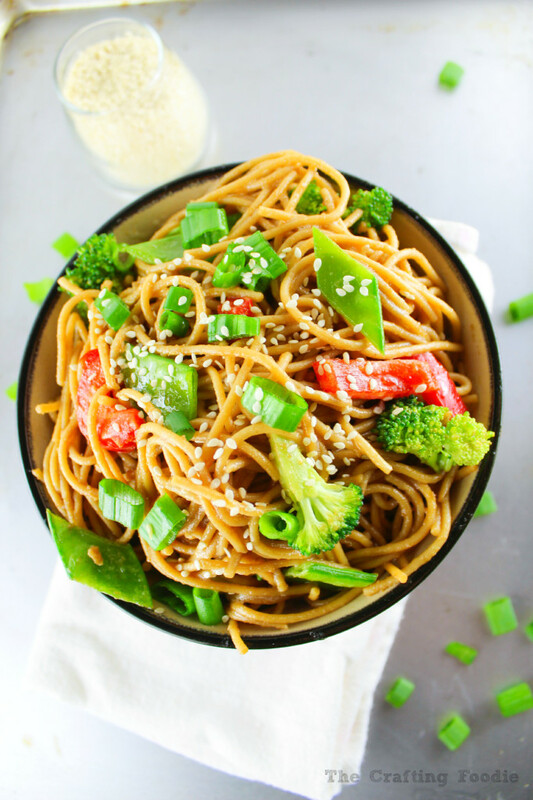 Aren’t these noodles just so good and easy to make?